This year was Project Survival Media’s biggest year since our founding. We produced more media than ever before, doubled our budget from years past, and provided stunning coverage for critical movement moments. A big congratulations to all who contributed to the growth of our work! We won a competition! In 2014, our team in India was awarded first place in the video category of the Environmental Journalism Competition in India. Our film “The Garden Game Changer, started out on the Thomson Reuters Foundation publication and moved on to win first prize. This was such an honor and validation of the tireless work our Solutions 4 Survival teams are pursuing. We launched the Survival Media Agency. This project has been a long time in the works. It started off as a side conversation in a cafe in Seattle with a dear friend and monthly sustainer of ours and has now blossomed into a full fledged network of media makers across the globe who are well versed in climate communications with a bend toward equity and justice. Their stunning portfolios can now be viewed on our new site, which can help organizations connect with a media professional near them. Raising that $$$! This year our director raised nearly $80,000 in a combination of small donations, medium level donors, stock gifts, small grants, and contract fees. That is double the average of our budgets in years past!! And, impressively from a diversity of sources. We are entering 2015 with nearly $30,000 in the bank. Continuing at the helm of the movement for Climate Justice. 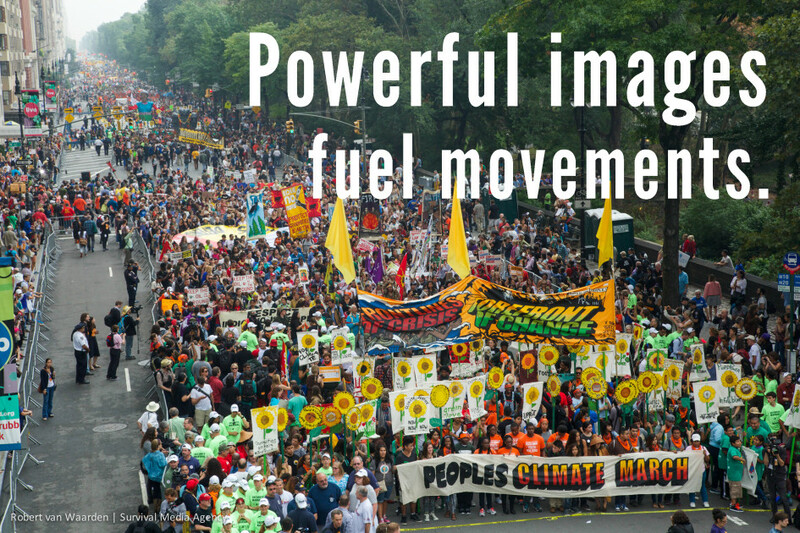 This year we were the official photographers for the People’s Climate March — our photos were shared all over the globe, helped connect people who couldn’t make it to the march to what was happening on the ground, and amplified the message of the marchers that it is time for real climate action for the health of all communities. We were also proud to offer our services to several climate justice organizations either at a very discounted rate or entirely for free. We will continue to provide these services in 2015. We are so excited to continue the journey with you in 2015!